I've decided that this is it for 2011, I've stopped working and I'm going to take a break from blogging too. I really need to get rid of this stinking cold and violent cough that I've had for well over a month now, I can't let flu set in like it did last year. So as of today the 22nd I'm taking a well earned break. I've made great progress with the gluten free diet this year, yes there have been some glutening episodes, one in particular that was so awful that it took me two months to fully recover from, but from that I learnt about PPM and why when a product says it's gluten free, that isn't always the case. 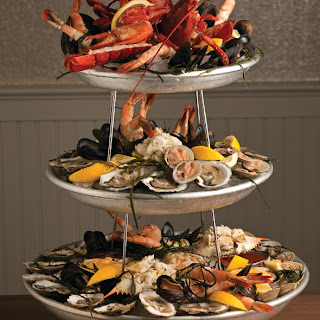 This is what I'm hoping for, I don't expect the tiered platter, but a single big plate of lovely shellfish would be great. In reality as years before have shown, I will be directed to the fridge where there will be countless bags of shellfish goodies and I'll end up eating them out of the bags at the table whilst using a big bowl to put all the shells in. It isn't the most glamorous of Christmas lunches when eaten in such a way but it still tastes incredible. Who knows, this year I may get the surprise of a platter so I can dine in the way that my parents and other half do with their traditional roasts. Photographic evidence of just what happens will be recorded for amusement. Ah, being a coeliac! The thing about being gluten free for me is that I am constantly shocked and surprised at how good ready made gluten free sweet things are. I'm no baker and messing about with flours doesn't appeal but it matters not. There's so many tasty treats out there. 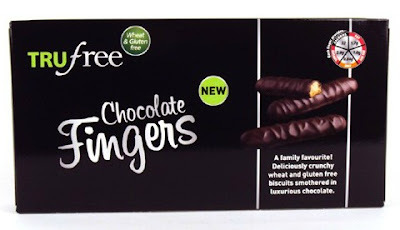 About 18 months ago I discovered Trufree, I sampled biscuits and crackers which were and are lovely, but one day whilst shopping I noticed something new; Trufree Chocolate Fingers. I still haven't had any. 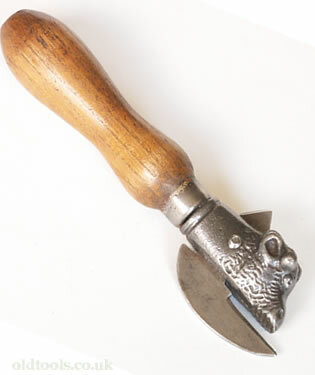 It appears as though I'm going to need an old fashioned tin opener to get into it. Just as well the tins are thick, over the course of the last week I've been hearing these 'popping' noises and have been wondering where they've been coming from. Mystery solved, it's the surstromming tins bulging *insert somewhat concerned expression here*. 200C for 20 minutes and you have gorgeous naturally gluten free chestnuts to snack on. These are probably my most favourite of all Christmas foods, don't be too hasty to eat them though, I'm sporting a blister on my thumb from an eagerness to scoff them. Ouch but yum. Oh and you must cut them a little before you roast them or else they'll explode and leave a huge mess in your oven. I've been thinking about Christmas dinner, two years running I had shellfish whilst I looked on longingly at my parents and other half's roast dinners. Last year my mum attempted to cater for me (I had previously refused, as she hates cooking and I didn't want to risk it), which was fine except after I asked as to how the stuffing was made I was told with sausages. Regular, not gluten free sausages. Needless to say I had my first Christmas day glutening. I'm thinking, I should stick with the seafood rather than the roast, it's too risky. I can't expect my parents to understand gluten free in the way that we do at home, they're elderly and despite me telling them I'm gluten free for so long, it was only a month ago that my dad actually asked what gluten was. Not having a traditional Christmas dinner is starting to sound just fine to me! Due to still having this cough and cold that has been lingering for over a month now, I haven't been very experimental lately, we've been having the same old, same old. I guess it's due to being a bit under the weather but I'm realising more and more that although I do love cooking, the majority of the time I need convenience, even sometimes on weekends. There are so many things that aren't gluten free that should be. If you think about some foods and what actually goes into making them, there should be no gluten present, so why is there? Filler. Lots of things are pumped full of filler to bulk them up. Taramasalata in the supermarket form isn't what I would consider to be real taramasalata, it bears no resemblance to the good old fashioned deli versions that I grew up with. Most, if not all shop bought taramasalata's contain breadcrumbs, why?! This is a naturally gluten free food that if done in a traditional way certainly doesn't require the need for blooming breadcrumbs! I'm a huge fan of marinating meat, I love how tender it makes it. This was a total experiment purely because I'm all out of my beloved oyster sauce (thanks Waitrose for not stocking it anymore! Now we have to buy it online in bulk - it's Blue Elephant btw). I think that oyster sauce is a staple ingredient to have in the kitchen but seeing as I'm out I tried something completely different. Pad Thai sauce, I discovered it in the world food aisle of my Tesco. At the moment I have no idea what the brand was but I'll post that up after my next shopping trip. WorldFoods is the brand, it clearly says no gluten and suitable for coeliacs on the label. Following on from my Pitta Pizza Pockets post (tongue twister! ), I was just thinking, what can I have for lunch? And I remembered that I had a pitta bread left over from the pizza pocket experiment. As I only managed half of one last time, I did the same amount again but this time I just opened the pitta up (much easier if you cut them in half first) and squished a couple of slices of mozzarella in. 3 minutes later and I've got a gorgeous Cheese Pitta Pocket that I am going to dip into Scotch Bonnet sauce. Seriously, that grill is perfect for me! Ok, so it's a bit of a mouthful to say but that's what they are and they're a great light(ish) lunch or a snack. I used Asda pitta breads, they were a bit of a nightmare to cut open and load but that wasn't too much of a surprise, we are talking gluten free after all. I can make these better but this was lunch after food shopping, I'm always really hungry after that and so it was a bit of a quick experiment. Worked out great though. Not the best form of presentation but who cares when you're hungry?! I just whipped these up and devoured them. I sliced a DS Gluten Free baguette, spread some ready made garlic butter on them then added the cheese on top, this time I used mozzarella and gouda. Put them in the oven for 5 minutes and hey presto! Gorgeous gluten free garlic bread with cheese. Hot bread usually gives me terrible indigestion, but thankfully it's minimal at the moment. Just. I hadn't marinated the chicken so for quickness and ease but still great flavour I used a stock cube, broke it down in a tiny bit of boiling water and made a paste. It covered the chicken pieces beautifully and tasted great too. I can't be doing with plain chicken, it isn't worth eating. 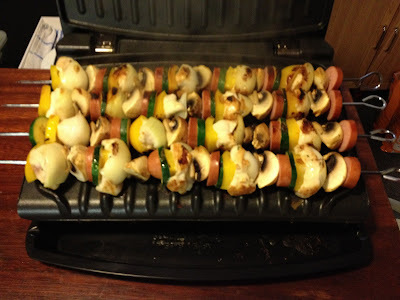 I used my George Foreman grill to cook these but you can cook them in a number of ways. I always used to fry mine, I never added oil to the pan though as I coat the ingredients (minus the chicken and sausage) in oil prior to putting the kebabs together, this is a great way of making the base for a sauce. Deglaze the pan once the kebabs are cooked and you have a lovely sauce to pour over. 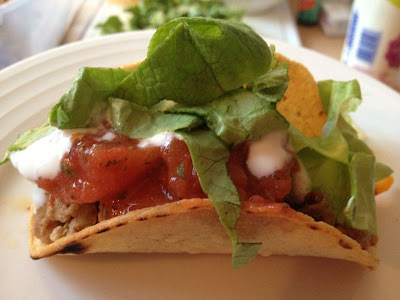 Anyway, chicken kebabs, easy, healthy and delicious. It doesn't get much more simple than this. 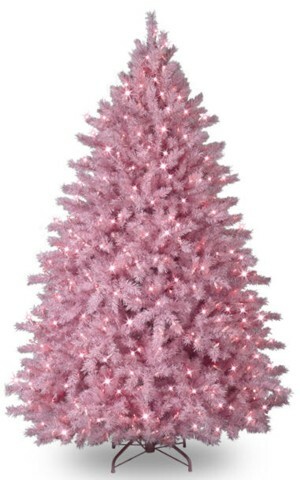 I had the happiest, loveliest long weekend ever, so much so that I just want Christmas Eve here, right now. I cannot wait for that holiday this year. Talking of Christmas, don't decorate your tree whilst drunk, ours looks like something a drag queen would wear. The long weekend meant that more time could be spent in the kitchen, we even deviated from the regular weekend eats. We were supposed to have fondue but I bought a new cheese to throw into the mix and it turned out to be so different and good that I didn't want to use in in the fondue. It's Le Pied Angloys, much like Camembert but with a hint of honey, a great find for a cheese freak like myself. Lack of cheese meant no fondue, but soon. George Foreman Grill - What A Time Saver! I'm growing incredibly fond of George, I didn't think I would need him, so I didn't ever want him, but now that he is in my life he's here for good. One of my birthday pressies was a family sized George Foreman grill, like I said, I never thought that I would have any use for one but oh my, how wrong I was! I struggle on week days for meals for me and I really can't be bothered to cook for myself. If it isn't something that takes 5 minutes or less I simply do not want to know! I'm beyond excited, I'm actually in possession of 3 tins of surstromming! Surstromming is considered by some to be the most stinky food in the world. It's fermented herring and I've spent many an hour laughing at videos of people on YouTube who dare each other to eat it. Lots don't get past the opening of the tin stage. 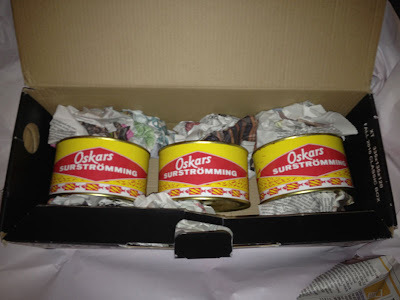 Surstromming may be a bit of a giggle for some but it's actually a Swedish delicacy and that's why I want to try it. I'm down with what others may consider to be disgusting tastes, the stronger the flavour with seafood, the more I want it. 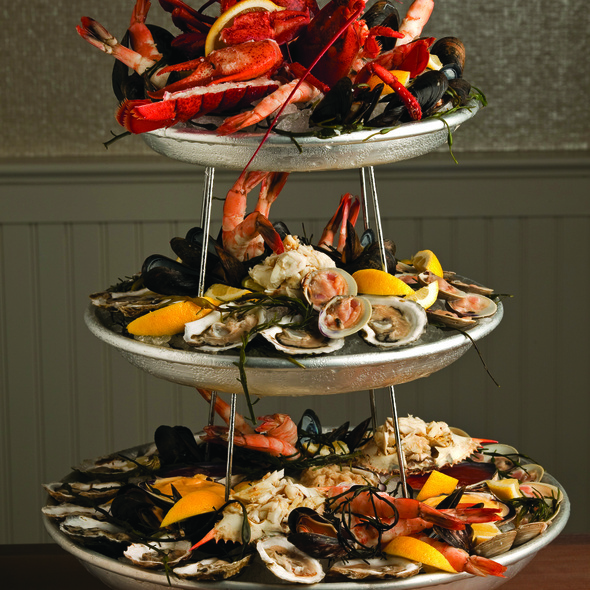 Caviar, Oysters, Smoked Roe, Schmaltz Herring, Brown Shrimps I love the lot. Since being gluten free customer service has become very important to me. It's essential to know whether things contain gluten and also in my case, pepper. I've come across some great customer service via twitter and email, for instance, not all gluten free products agree with me, I have a very low tolerance for PPM. Once I realised this it was important for me to ask any new brands I was thinking of trying what their PPM of products was. I've been pleased with the responses, even if I can't have the products. 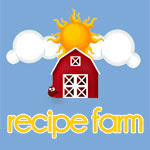 My Gluten Free Batter Mixture Featured On Prime Time ITV Show! Yep, no lie, the other night my original gluten free batter recipe was on ITV, I could hardly believe it. There it was in a vast quantity for millions of viewers to see. When I first found out that I was a coeliac lots of kitchen experiments went on, one was to find a batter that could coat things and be deep fried. Obviously the main ingredient in batter is flour so of course, we had to find out what flour would be best suited. One particular time I came up with the idea of just mixing corn flour and water together to make a nice thick batter to coat chicken. I thought I had it, it was looking really promising when I was mixing it.